Takeaway: Installation methods, soil properties and conditions, external loads, and geotechnical hazards are some of the factors that engineers and contractors must consider during pipeline design and installation. Pipeline networks are one of the most vital infrastructure systems in modern civilization. They act mainly as distribution systems to facilitate the transportation of large quantities of fluids, such as oil, water and gas across geographic locations. In some cases, pipelines can also act as conduits for the installation of utilities. In most applications, installing piping networks below ground is usually the preferred and most feasible option. One of the main benefits of installing pipes underground is the ability to use the soil to support the piping over vast distances; this eliminates the need for complex and expensive above-ground supporting structures. Furthermore, subsurface pipelines are also shielded from exposure to potentially damaging environmental effects, such as severe weather and UV rays, as well as man-made perils, including vandalism and accidental impacts. The satisfactory performance and longevity of buried pipelines are heavily dependent on how the piping structure interacts with the surrounding soil. Geotechnical engineering (a subdiscipline of civil engineering), therefore, has a dominant role in the design, construction, installation and satisfactory operation of buried pipelines. Geotechnical engineering takes into account numerous factors related to the use of earth as an engineering material, including installation methods, soil properties and conditions, external soil loading, and geotechnical hazards. The interaction between the soil and the pipe can be complex, often requiring geotechnical engineers to use sophisticated numerical modeling to accurately predict pipeline behavior. One of the first factors that need to be taken into consideration in the design and installation of underground pipeline systems is the intended installation method. Buried pipelines are typically installed by either conventional open-cut or trenchless methods. Open-cut, also known as cut-and-cover or trenched installation, is the most common installation method for shallow pipeline burials. During this technique, a trench is excavated to the desired depth and alignment, and the pipes are placed on a level surface at the bottom of the channel. Depending on the geometry and stability of the trench walls, appropriate earth support systems and dewatering may be required. Once the pipe is laid in place, the trench is backfilled with the native soil material. In developed areas, where trenches are cut across roadways or other infrastructure, the backfill material should be adequately compacted to the specified density. Trenchless methods, on the other hand, are more sophisticated and are ideal for deep installations in challenging situations, such as water crossings, mountain passes, etc. As its name suggests, trenchless construction involves the installation of piping systems without the need for a visible open-cut trench. Some of the common trenchless technologies used in the installation of underground piping include horizontal directional drilling, horizontal auger boring, microtunneling and pipe ramming. Trenchless construction technologies are becoming increasingly popular due to their minimal impact on both urban and environmentally protected areas. Adequate knowledge of the existing soil properties is one of the critical components of proper pipeline design, construction and installation. This is especially crucial when using trenchless construction techniques, where particularly challenging conditions may arise due to unforeseen soil and groundwater conditions. Geotechnical investigations help engineers determine the geological and physical properties of the soil, as well as the groundwater conditions at the site under consideration. These investigations can range from low-volume sampled test pits to more extensive in-situ testing and geophysical profiling. The extent of exploration and testing is dependent on the knowledge of the regional geological conditions, the depth of the particular pipe alignment, and the method of pipeline installation. For trenchless installations with relatively deep alignments, deep geological test holes are required to obtain the relevant soil samples at the required depth. Soil investigations can help reveal vital design information such as bearing strength, shear strength, moisture content and plasticity index. 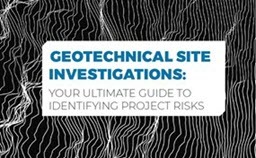 Using this information, geotechnical and civil engineers can put necessary design measures in place to counteract conditions that may be detrimental to the pipeline integrity including settlement, heaving and lateral movement. In addition to internal pressures due to the transported contents, underground piping must be capable of adequately supporting various external loads. This loading can originate from the soil itself or from forces transmitted through the earth from the ground surface. Static loads, also known as dead loads, are considered to be forces that are relatively consistent for an extended period of time. This type of load typically originates from the weight of the soil fill above the pipeline. As the height of the fill increases, the weight of the soil supported by the buried pipe also increases. Live loads, also known as imposed loads or transient loads, are forces that are considered to be temporary and change over time. These forces usually originate from the ground surface and typically include vehicular loading. Live loads are especially crucial when underground pipes traverse roads, highways and railways. Pipeline designs can be greatly influenced by the presence of groundwater and temperature changes. Buoyancy can be a significant factor in situations where the pipeline is installed below the water table. The worst-case buoyancy scenario occurs when the upward force exceeds the downward force exerted by the soil loads and pipe weight. Thermal forces, on the other hand, can result in the buildup of internal pipeline stresses due to frequent expansion and contraction. This type of loading can be considerably large in climates with significant seasonal temperature changes or in pipelines that convey fluids with varying temperatures. Buried pipeline structures can also be subjected to extreme, temporary loads that are not consistently present under normal operating conditions. These loads originate from external sources and can often be intense in nature. Typical geotechnical hazards include damage from seismic activity, slope failures, volcanic hazards, ground movements from discontinuities and faults, etc. Necessary systems must, therefore, be put in place to prevent failure or mitigate adverse outcomes should failure occur. Several geotechnical engineering factors must be taken into consideration to ensure that underground pipelines operate safely and effectively in a given environment. Installation methods, soil properties, external loads and geotechnical hazards must be carefully analyzed by a qualified geotechnical engineer as these factors are dependent on the intended installation site.